Governor Culver stands in front of the model of the U.S.S. Iowa. 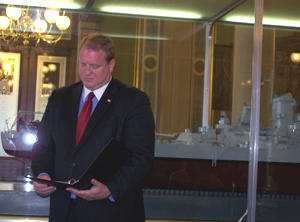 Governor Chet Culver signed a joint resolution of the Iowa House and Senate today that lends the state’s support to a California group that is trying to save the battleship U.S.S. Iowa from the scrap heap. Culver added his name to the resolution in front of the model of the U.S.S. Iowa on the first floor of the state capitol. He says the proclamation will formally support the preservation and relocation of the Iowa and give some resources to help. Culver says it also creates a 10-person committee to help with the process. Senator Jack Kibbie, a Democrat from Emettsburg, says the resolution was a bipartisian effort to save the state’s namesake. He says once the battleship is restored, all Iowans will be able to tour the ship. Kibbie says as a soldier in a tank in Korea on Heartbreak Ridge, soldiers knew the Iowa was out there supporting them as well as aircraft carriers, and he says he personally used shells from the tank to spot targets for the battleship. Kibbie says the model of the Iowa already makes an impression on young people who visit the capitol. Kibbie says thousands of young people tour the capitol building every year, and one thing they remember about the tour is the model of the ship. Bill Stephens is vice president of the group in California that is trying to take ownership of the battleship. He says the state’s seal of approval is key. Stephens says it’s very important as it shows the Navy that the state of Iowa is behind the effort and he says the state’s public support is invaluable. Stephens and others from the “Historic Ships Memorial at Pacific Square Mare Island” are trying to raise millions of dollars and he says this boosts that effort too. Senator Jack Kibbie speaks about the U.S.S. Iowa. Stephens says it’s a vehicle to try and access corporate funding for the ship. He says private individuals have been giving, and now they want to get Iowa corporations involved. The U.S.S. Iowa was the namesake for a new class of battleships and was launched in 1942. The ship carried President Franklin Roosevelt to Tehran for meeting of international leaders during the war in 1943. 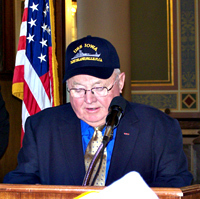 For more information on the fundraising effort, go to www.battleshipiowa.org.